MANILA, Philippines - Boy band JYJ member Jaejoong didn't disappoint his 4,000 supporters by showing up at his first fan meeting in Jakarta, Indonesia. Before he went to Indonesia, the singer and actor was suffering a bad case of sore throat. Despite this, he decided to go on with the fan meeting held at the Mata Elang International Stadium. His illness, however, forced Jaejoong to skip the press conference. At the fan meeting, Jaejoong was unable to speak owing to his condition but communicated with his fans by using an iPad. A handwritten letter from Jaejoong was also read in which he told fans that he was sorry that he can't talk or sing. “I am sorry. Even though I can’t talk and sing, I think I have to come to see you guys to make memories together. This moment I feel like I’m the happiest man in the world. Thank you,” Jaejoong wrote, according to the JYJ official Facebook page. 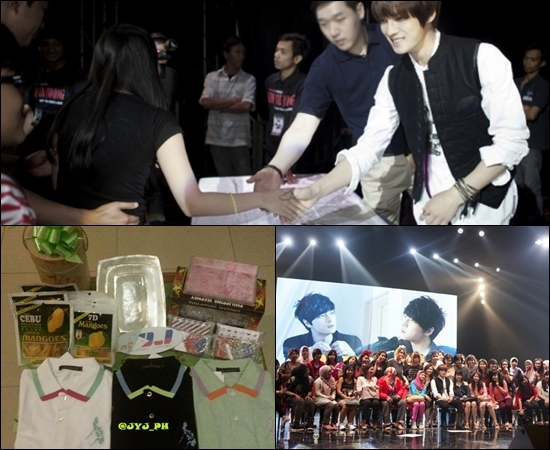 and gifts for Jaejoong from JYJ Philippines including dried mangoes. Indonesian and international fans attended the event, Filipinos included. Two admins of fan club JYJ Philippines and other Filipino fans flew to Jakarta to see Jaejoong. Members of JYJ Philippines told Bulletin Entertainment about their wonderful experience at Jaejoong's fan meeting. They prepared gifts for Jaejoong and bought official merchandise at the venue including t-shirts, mouse pads and iPhone 4S cases. When the fan meeting started, "everyone was welcomed by the big picture slideshow of Kim Jaejoong on the stage. And then each fan happily seated on their respective seats." Emcees Ichsan Akbar and Vince then asked fans to shout Jaejoong's name. "After the fans repeatedly shouted Kim Jaejoong’s name, finally he entered the stage. Then everyone was screaming so loud," JYJ PH said. And since Jaejoong was unable to talk and sing, the program was changed. Jaejoong's letter of apology was read by the MC and his fans shouted "gwenchanayo," which meant "it's okay." Video clips of Jaejoong's dramas "Dr. Jin" and "Protect the Boss" were shown. The MCs asked questions and Jaejoong answered them by typing on his iPad. A video of the song "Living Like A Dream" was played and the fans sang along. A fan-made video was also shown. "Everyone witnessed that he got teary eyed," JYJ PH said. And because of his condition, Jaejoong made up for this by having a photo and high-five session with his fans. Fans thought he would only do this for certain ticketholders but they "were surprised that even the attendees in the last section were also given a chance to have a close encounter with him." "Jaejoong gave his final message after the high-five and photo session and he bowed to all his fans before he went backstage. [Every] fan in the event went home with a wide smile on their faces," JYJ PH said. JYJ PH added, "This is really a dream come true for all the JYJ Filipino fans to have a wonderful experience like this with their idol Kim Jaejoong." Jaejoong's next fan meeting will be in Vietnam on Nov. 10.